Six large Victorian houses at Lancaster Gate, London, are being converted into an international student’s hostel. With space at a premium, the architects were driven outside to provide a service tower at the rear of the building, carrying all the hostel’s bathrooms. A circular structure was decided upon with a diameter of 21 ft. Access to the bathrooms is by a spiral ramp which winds up the building. The tower structure consists of a steel-framed core with beams radiating from it supporting a continuous spiral steel ramp which gives access to thirty bathroom ‘pods’ made from glass reinforced plastic. The twelve pre-fabricated sections from which the core was erected were placed one on top of another by means of a beam slung from the existing buildings. A revolving lifting beam with winch, attached to the top of the core positioned the remaining steel members, bathroom ‘pods’ and ramps. 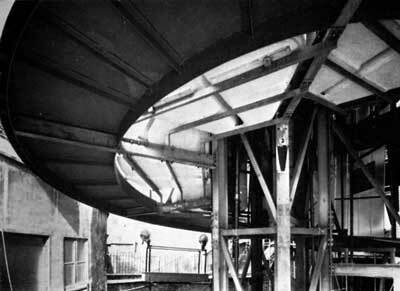 Radial beams were placed in position and supported from the core by diagonal hangers. Each radial beam was at 60° to and 1ft 21/2 in higher than the last. ‘Pod’ support beams were fitted between the radial beams and the structure was ready to receive the first bathroom ‘pods’. This erection work was completed and all bolts tested to the satisfaction of the District Surveyor within three weeks and exactly on schedule. All steelwork – main structure and ramp units – was shot blasted and zinc sprayed to BS 2569 Part 1: 1964 and all nuts and bolts were cadmium plated of an HSFG type using load indicating washers to indicate correct shank tension. The architects for this most interesting structure are Farrell Grimshaw Partnership.